Originally appeared in the 10th Annual Tri-State Pottery Festival June 16, 17, 18, 1977. At Beaver Creek State Park. Located in the center of the greatest industrial area in the western hemisphere, within 75 miles of over seven million people, Beaver Creek State Park is one of the most scenic spots in Northeastern Ohio. It is of historical interest since it contains the only well-preserved lock of the old Sandy and Beaver Canal. Being the only State Forest Park in east central Ohio, it provides an opportunity for enjoyment of outdoor life for many thousands of people. 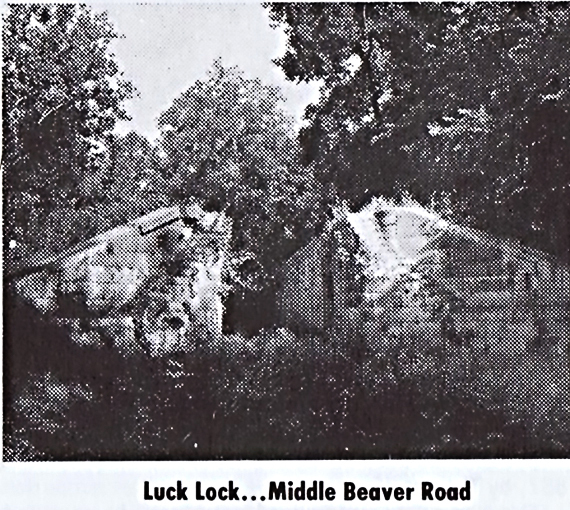 Located eight miles northwest of East Liverpool off Route 7, Beaver Creek is one of the last wild and primitive areas left in the Middle West. The park area includes stream, bottom land, gorge and forest, and is traversed by Little Beaver Creek and the abandoned Sandy and Beaver Canal and about 40 locks including the Simon Gurty or Lusk Lock, which is still intact a century after being abandoned. The creek is navigable by canoe or rubber raft in all but the driest periods of summer. Swimming is not permitted within state park grounds. The valley of Little Beaver is characterized by steep walls, high rock cliffs and many gentle rapids. Exploring the many tributary streams, the hiker will find several beautiful waterfalls. The valley at Lusk's Lock, near Elkton adds much to the historically minded. The lock was built in 1836, as one of the 90 locks on the 73-mile Sandy and Beaver Canal. This is an outstanding example of the very best class of the stone-work of our forefathers. An old tradition is that the deep valley at Lusk's was one of the favorite haunts of Simon Girty, the notorious renegade of the Revolutionary era. Columbiana County has long been known for its large collection of log structures. But, as the years went by a great number of them have been dismantled, moved elsewhere or destroyed. In the 1960's and 70's several log structures were doomed. The Hole Farm and Village saved two for their restoration program near Bath, Ohio. St. Phillip Neri restored one because it was the site of the first mass in 1817. It is now located in front of their church at Dungannon, Ohio. William Vodrey hired Robert Kelm to move a beautiful log cabin from New Franklin, Ohio, to Fredericktown. Several log structures were offered to the Columbiana County Forest and Parks Council as a gift. Near the northwestern entrance to the park just off Route 7 is a high bluff where the restored Williamsport Chapel stands. The church was purchased in 1965 and restored by the Council as a non-denominational church for campers. This churchyard is on the corner of four townships. Beyond the chapel is the primitive camping area. This wooded area has many sites for tenting, trailer camping, complete with fire sites, latrine and marked hiker trails. One short trail leads to Oak Tree Point which gives a panoramic view of the creek and volley. In this small deep valley are found Gaston's Lock and Gaston's Mill. The mill is a restored water-powered mill built in 1837, by Thomas Whitacer. Other owners, in order, were Jacob Rosensteel, Oliver Cope, Joshua Coleman and then Levi Hickman, the lost owner and operator. Mr. Hickman was the father of Mrs. Blanche Williams, who still lives an this place. Operation was discontinued about World War I time. 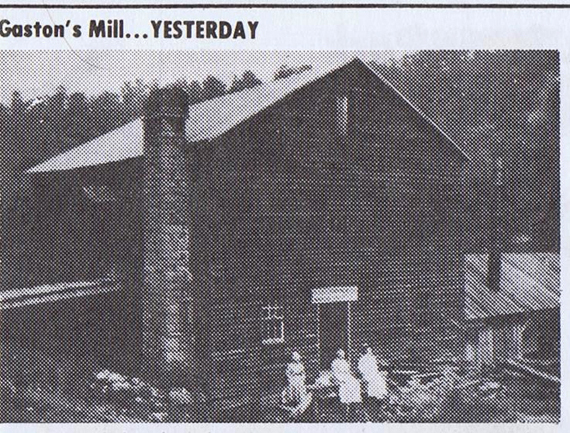 The mill was operated by water power until after Mr. Gaston had sold it. It was later operated by a steam engine and then by a gasoline engine. 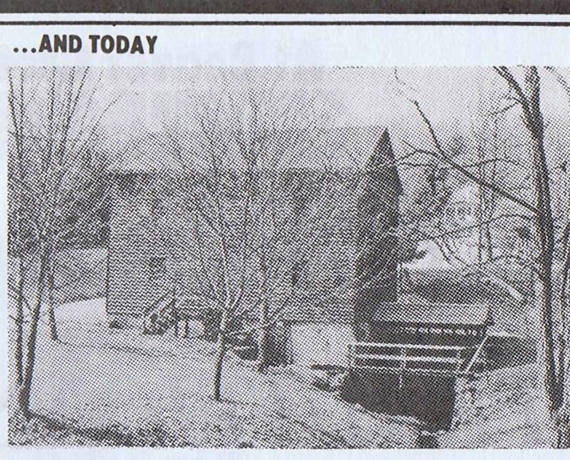 Gaston's Mill was the lost of six mills which once operated from Elkton to Fredericktown. Corn, oats and wheat crop, corn meal and buck wheat flour were mode. Grinding was done by the mill stones. Ice was stored in the basement for summer use. Grain was dumped on the second floor, ground on the first floor, then elevated to the third floor for screening. Payment for grinding was one-eighth of each bushel of groin ground. This would be sold or fed to livestock by the operator. The roof, siding, some of the beams and part of the floor have been replaced. Most of the posts are the original timbers. Shingles for the new roof were made in 1964 by an old shingle machine built in 1857 in Salem and now owned by Sell Brothers, near Guilford. The chimney and parts of the wall have been rebuilt. The picture quality isn't the greatest. Firms in Columbiana did the gear work without charge. The N.R.M. Corp. made the castings for the gears; the labor union there did the necessary work to restore the mill machinery. Ferrol Pattern Company made the pattern for the gears, the Wm. K. Stamets Company did the machine work on the gears and delivered them to the mill. Wilson Lower did the engineering work. The Franklin Furniture Company mode the wood teeth for the gears. Mill restoration was completed in 1971, by local funds under a contract between the Columbiana County Historical Association and the Ohio Division of Parks, and an agreement between the Columbiana County Forests and Parks Council and the County Historical Association. In 1974 it was designated on the National Register of Historical Places. The mill reopens for summer visitation each May 1. It began grinding operations again that day under the supervision of the Council. It is open Saturdays, Sundays and holidays. Nearby is the restored Thomas Malone covered bridge, moved from Elkrun Township and reconstructed. Later, the Council decided with the cooperation of the Columbiana County Historical Society and the Ohio Division of Parks to build a typical log school and pioneer's log cabin near Gaston's Mill in conjunction with the covered bridge and the canal locks and thus restore the surroundings to correspond with the structures contemporary to the mill of the 1840's when the Sandy and Beaver Canal was in full swing. Robert Kelm designed and did some of the construction on the log cabin and lag school house, which were completed in 1973. Most of the furnishings were donated. Our ancestors life in such cabins is captured in the following account by Beth Dailey. "Starting at the table, the housewife's dishes were made in the East Liverpool potteries, the spittoon on the floor was called Rockingham ware, and the teapot on the middle shelf of her cupboard is called "Rebecca at the Well." How nice to know at one time someone took the patience to name an item instead of giving it only a number. Her baking board on the end of the table is a very simple one. She would mix her bread and carry it to the dough box to rise; the dough box being placed near the fireplace for heat. She would bake her bread in the iron kettle suspended from the crane which swung over the fire. The dog on the mantle is a door stop made of Rockingham ware. The next item is a candle mold; the candles being the only means of lighting in the cabin. The three pieces, two plates and an open sugar, are pewter, which is made from lead and tin. The iron bowl on the far end is a mortar and pestle in which she ground her fried herbs far The spinning wheel is a flax wheel which she used to spin her flax into linen thread and from that she made aprons, towels and many more pieces which were needed in that day. The cobblers bench is quite interesting. The wooden shoe last was used inside a shoe which was to be repaired. The awl was used to make holes in the leather so the tacks could go in easier. The wooden piece on the floor is a shoe jack by which boats were removed from the feet. The small stand holding the wash basin and soap, with a small mirror hanging on the wall, is part of the bathroom. On the other side of the cabin are the sleeping quarters. The bed is rope bed, with a tick which is filled with leaves, pine needles or straw. The tick was refilled in the fall, for comfort and warmth in the winter. The small pot under the bed is the other part of the bathroom. The rocking choir is a half arrow back rocker. One can see the arrows very plainly, so we can thank the Indians for them. The pretty cradle is all fixed for the new baby loft. The loft was always warm as the heat from the fireplace would rise and the children were comfortable. The large wheel in the corner is the wool wheel on which she spun her wool into yarn. From there she put the yarn on the wool winder. Turning the wheel 125 revolutions, she made a skein of yarn. She then could say it took two skeins to make her bonnet in the clothes press on the wall, or so many to make the shawl. If she wanted to dye the yarn she would use berries which were gathered from the woods. The identity of the picture of the old gentleman hanging on the wall is unknown to us, but we thought he was so handsome and that he fit so appropriately in the setting." 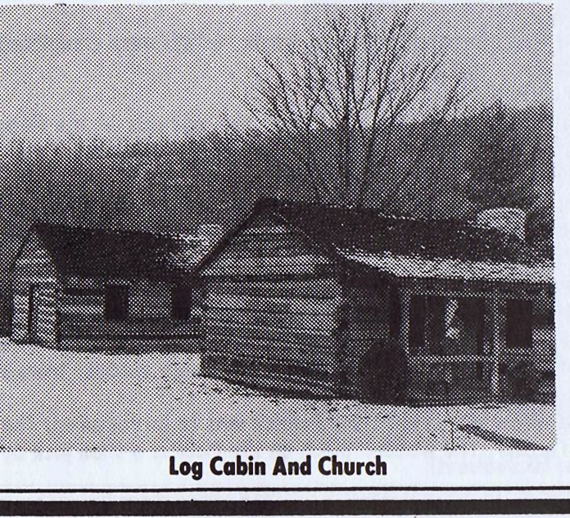 The log church was completed in 1976 and in 1977, a log blacksmith shop is under construction. A short distance up the hill are the park office and maintenance building. Fred Steputis, who provided much of this information, is the park superintendent. A parking lot, a play area and two picnic areas are nearby. No open fires are permitted while tables and grills are provided in the pine groves and along the creek's east bank. At the north end of the iron bridge spanning the creek, the Vondergreen Trail leads out along the north side of the creek. 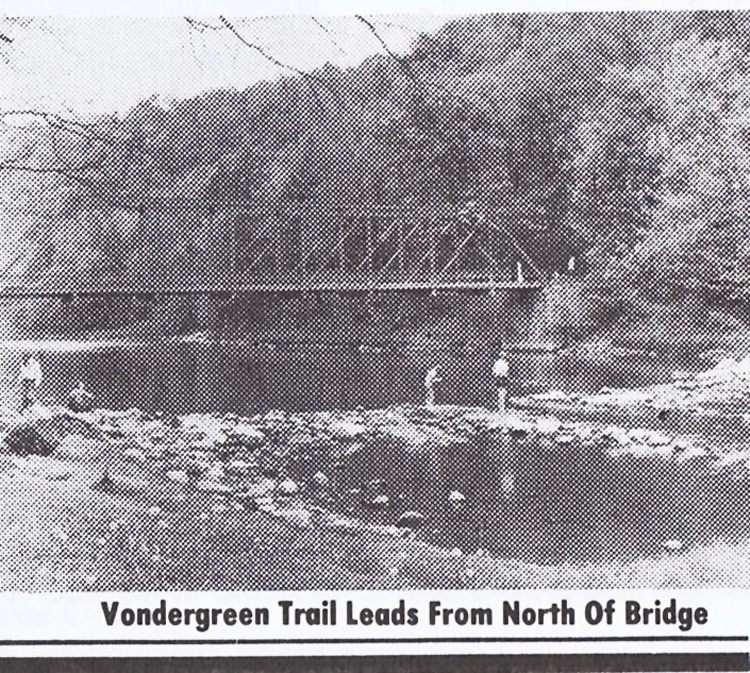 The Vondergreen Trail follows the course of the Old Sandy and Beaver Canal, through a very wild and primitive area. The park naturalist program offers special nature tours and instruction to the young and old alike. The Sprucevale area is farther east and can be reached from the park office by going north on Echo Dell Road to Sprucevale Road and then south about three miles back down into the creek gorge. Sprucevale is the site of a long abandoned ghost town. At one time this village boasted a post-office, store, woolen mill, flax mill, saw mill, blacksmith shop, two canal locks, docks and 20 houses. The sole remnant of all this is the skeleton of Hombleton's stone grist mill. The creek here is a famous fishing spot and brings many anglers to the Sprucevale bend. Fish available include bluegill, smallmouth boss, rock bass, carp, sunfish and catfish. From the picnic area at Sprucevale a trail on the north bank of the creek leads to the renowned Gretchen's Lock. The unusual flora of the park is of interest to the botanically inclined, as the area contains some mountain laurel, black birch, cucumber, beech, maple, chestnut oak, paw-pow, Canadian yew, yellow birch and hemlock. There are several spots with natural growths of the Giant Lady Slipper, a native orchid. Beaver Creek State Park was set up by the Ohio legislature in 1945. Some land was acquired in the next two or three years, but little progress was mode until the 60's. It now contains over 3,050 acres. About 20 miles of the creek has been designated a wild river and 16 miles of scenic river. An unusual plaque mounted near the bridge at Echo Dell designates part of the creek as the wild and scenic river. It was the fourth Ohio river designated as scenic river under a 1968 law. 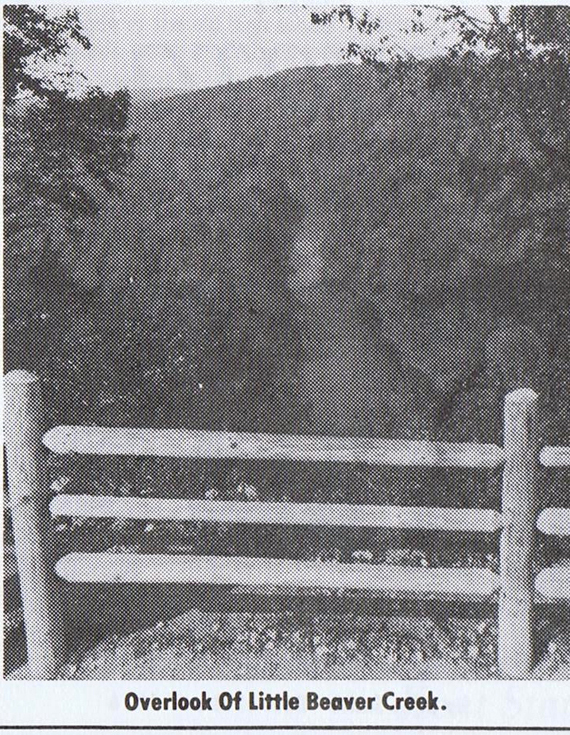 It was the first wild river designated by the state. The 36 miles of the Little Beaver designated include the river's Middle Fork from Elkton to the Ohio-Pennsylvania border, the North Forks loins the Middle Fork, and part of the West Fork south and west of Williamsport. The park is open from 8:30 am, until 10:30 p.m. except for campers.